This is workout #2 of the Lean Muscle Building Challenge. Tonight’s workout is tough! The video is below. This one is focused on toning and strengthening your arms. I used two 20 lb dumbbells in this workout. Choose a weight that is appropriate for you. How do you know when it’s time to upgrade your weights? So, if you are doing more than 20 reps with ease it’s time to upgrade your weights. I’m an Occupational Therapist so my focus is always on what’s most functional. For me, that means I want to build strength and endurance at the same time. For muscular balance and optimal benefits you need to have both. This is why I typically structure my workouts for 15-20 reps, with beginners starting at 10 reps. When you are starting out you need to build strength. Once you have a base you are able to start working on strength and endurance, and progress your fitness and health upward from that point. *If you max out during the workout (can not do any more of the exercise with proper form) that’s okay. You will see that I max out a few times during this workout. It’s a great way to build strength, and to monitor your strength gains when you repeat the workout. 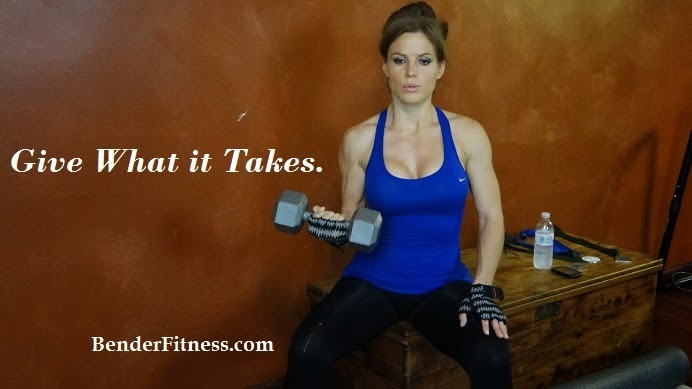 Melissa – I was SO inspired by your Diet Bet challenge, and absolutely loved the HIIT workouts. I ended up losing 6.5 lbs doing your workouts and following your advice, and I just joined another Diet Bet for February. Will you be doing another Diet Bet challenge soon?? I enjoy all your workouts Melissa Bender…excellent work! You are the best Melissa!!! awesome workout as always!!! JELLO! You are such a role model. Thank you Bender power couple! Did this yesterday twice through. 1st workout was the new 10min jumprope. Today my triceps are sore. I was using 5kg each Dumbbells throughout the workout. Good thing you added bodyweight push ups in this routine (the climbers combo + the elevated PU). I will get new weights soon. thank you melissa for all the useful tips. Love you and your workouts. Can’t move arms to type. *Thumbs up* Yay!! Nice workout! Used a 20 pounds for rows/tricep drop and 15 pounds for the other exercises. Looking forward to do 2 rounds next time. I loved the 2016 January Diet Bet, but it was over too soon! Two weeks into February I realized I was not caring for myself as well as in January. So I joined another DietBet and am now doing this 30-day challenge. Thanks for everything you do and love to Baby Boy Bender! Baby boys are the best! Day 3 of the lean muscle challenge done! I did a 4 mile run with 2 x 1.25 mi intervals worked into it. Then I did 2 rounds of this arm workout. So tough! I had to take down the weight on one or two moves in the second round because my arms were so pumped and dead! thank you for this! I finally found an upper body that gives me next day soreness..yes! I recently hit a plateau with another fitnss site an MB is just the fix my workouts need!